The bike I selected after a lot of research was the Thorn Sherpa: a 26″ wheel, derailleur geared, steel framed touring bicycle. Schwalbe Marathon Mondial HS428 EVO Folding Tyre – 26 x 2.15 Inch (replaced after around 20,000km not because they were worn out). Second set replaced after 16,000km, one earlier due to a massive puncture second one as it was wearing out. There were a number of reasons why I selected the Sherpa and the specific set up at the time and most of them have been justified to one extent or another on the trip. As someone who knew (knows) next to nothing about bicycles I wanted something simple and rugged. The Sherpa seemed to fulfill those requirements as it has a very tough Reynolds steel double butted frame that is supposed to be able to stand up to a lot. 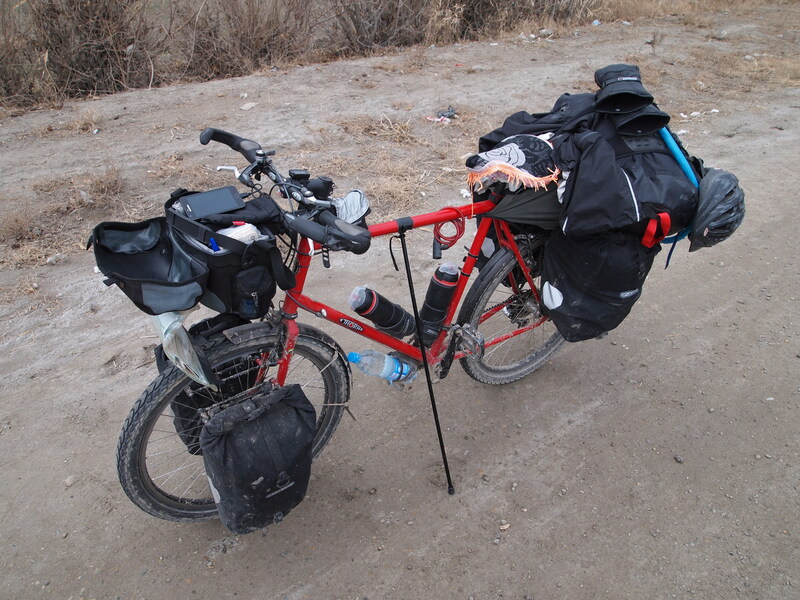 Having ridden across a large portion of rubbish central Asian roads at the time of writing I can confirm it must be pretty tough! I was also able to get my front fork bent back into shape after an accident which is definitely a benefit of steel. Also it was possible to get the Sherpa with 26″ wheels. This was important as I had read that getting 700c (the standard in Europe and the US) wheels or tyres was very hard outside of the west. As I was planning a lot of my touring to be in Asia I wanted to make sure I could get spares if something went wrong. Finally the Sherpa was in my price bracket and was made by an English company with a very good reputation for touring cycles. If I was going to go off riding round the world I figured I should do it on something reliable and made by a small specialised English company. Other alternatives that I strongly considered were the Surly Long Haul Trucker and VSF Fahrrad Manufaktur’s range. 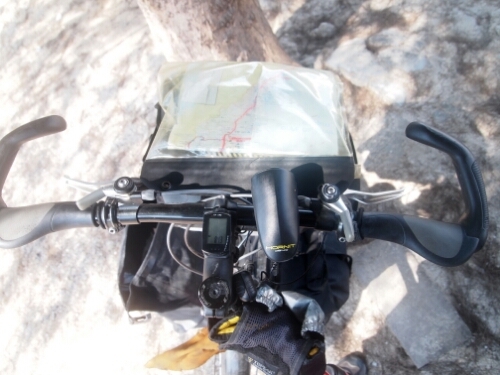 While I think I would have been happy with these bikes it was very convenient and easy for me to get a Sherpa and Thorn made it very easy to select and put together the type of bike that I wanted. A lot of the parts are fairly standard so I’ve commented on the ones that I made specific choices regarding or that have been commented on by other cyclists I have met on my trip. I wanted parts that would be easy to repair and unlikely to fail in the first place. I went for Andra rims as they are supposed to be very tough and able to stand up to a lot of punishment. They have done. I also went for some wide chunky Schwalbe Marathon Mondial tyres as I wanted the minimum of punctures and fuss. While they felt a bit overkill on the flat smooth roads of Europe and Turkey, in central Asia they have been amazing. I have had only one real puncture on the trip, which was in Switzerland and have ridden straight through pot holes and over rocks without trouble. Even on snow and ice they have performed reasonably well as I have been able to travel if not at full speed. Update for China: Got a lot of punctures in China from the wire inside truck tyres. These are sharp bits of metal like staples and they work their way into the tyres gradually causing in the main slow punctures. This has been the case in the USA as well. I chose thumb changers for my gears as they are simple to repair and apparently more durable than other types. This coupled with V-brakes means that if I can’t fix anything I should be able to find someone fairly easily who can do. The only thing that has gone wrong massively is the Shimano Deore Bottom Bracket which I had to get replaced in Tashkent. Apparently this had gotten so much water and grit in there that there was no grease anymore and part of it had been ground away. Not quite sure why this happened but I was riding in the wet and on some gritty dirty roads for quite a long distance and some must have gotten inside. I have had some troubles with an accident and have had to replace pretty much the whole chain set apart from the front derailleur. Basically all the Thorn built parts have been totally reliable and any issues I have had have come from Shimano components or accidents. For comfort I chose a Brooks saddle as I had heard good things about them for touring. I have had no problems with it other than slight saddle sores but never anything that has stopped me cycling. In fact I often feel more comfortable sat on the bike than I do on a chair after a long day’s ride. I also went for Ergon bar grips which give me something to rest my palms on and after some initial tweaking have been very comfortable. So overall the setup I went for has been comfortable, I can ride for a day and only get slight aching in my shoulders. One of the items of equipment I have been most pleased with is my Son dyno hub. This is basically the centre of the wheel where the spokes attach. I chose to get a dyno hub which allows me to generate electricity when the front wheel spins. I can use this electricity to power my front light so I don’t have to worry about batteries for it. That is more of a side benefit as batteries are pretty easy to get hold of globally. The main reason I got the dyno hub is so that I can charge my electrical equipment as I go. With the e-werk from Busch & Muller I am able to convert the electricity from the dyno hub into something that I can use to keep my mobile phone charged or to charge separate cache battery that I can use to power any electrical equipment that I have the adapters for when I am not on the bike. This has been very useful when wild camping or when I am using my phone a lot on the road and need to keep the charge up. Is that a Click-Stand I see? How is that working for you? I just bought one for my recumbent where fitting any other kind of stand, strong enough to cope with a pannier laden bike, appeared to be impossible. Any top tips? It is a click stand. It was working out well till I managed to bend it when my bicycle fell over. Normally the click stand just falls with the bike and is fine but it got wedged that time. I only just got it straightened…have to see if it still works. When it was unbent it worked really well, I guess the most important thing is to make sure it’s planted securely as they can be a bit wobbly. Not sure how easy that’ll be with a tandem! Man, I’m about to pull the trigger on one of these beaut’s. I’m 6′ tall but they suggested that I look at the 565L but from everything I know, it looks like I should be on the 600L. What’s been your experience with this machine? Can I ask what your pubic bone/standover height is? Are you comfortable with the height of the top tube on this machine? Thanks!! Hey, I’ve had a great experience. I’d say it fits me really well. My barefoot standover height is 86.5cm and the height of the top tube has been fine. I felt they fitted the bike to me well from the measurements I gave. Overall as well been really happy, it’s been rock solid for me. Thanks for the feedback! I think I’m going to go ahead and make my purchase in the next day or two. No problem. I hope you get some good touring on it and you are as happy with it as I have been with mine!